Cakes have been getting a little too much attention lately, it seems, so it was time for a pie. Or in this case, many mini pies. 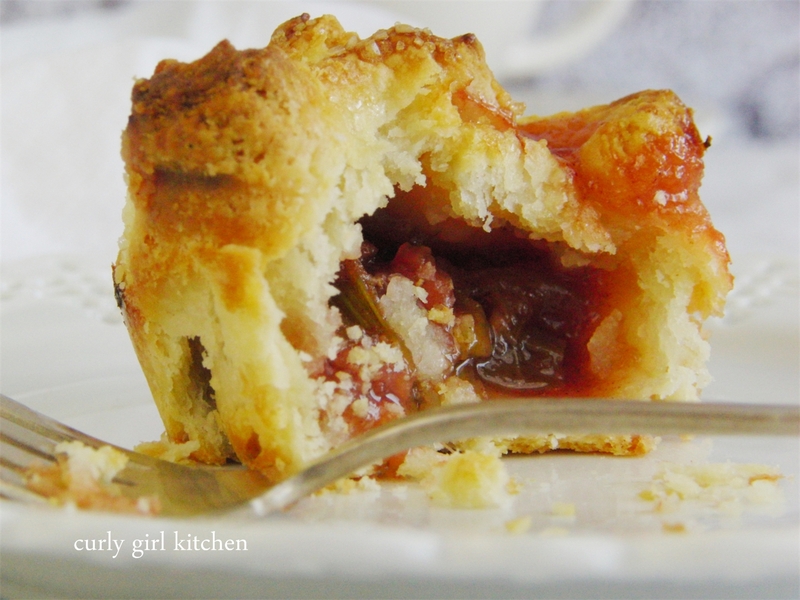 I still had some rhubarb left that I brought home from North Dakota, and I've been meaning to bake a rhubarb pie for Jamie, so I thought mini pies would be just as yummy, and a little easier to share the leftovers. I started by roasting the rhubarb with a little sugar, to bring out the juices and sweetness. But I didn't want to add too much sugar, because I really wanted them to be tart. So I kept the filling simple, and mixed the roasted rhubarb with cinnamon and my own homemade strawberry rhubarb jam, although any jam would do. For the pastry, I mixed up my all-butter pie crust, but instead of adding ice water to bring the dough together, I added buttermilk, just happening to have a little left in the fridge that I wanted to use up. I rolled out the dough and cut it into squares, then fitted the squares into muffin pans before spooning in the filling and pinching the corners of the dough together. A little chilling time, a brush of egg wash and a sprinkle of turbinado sugar for sparkle, and they were ready to be baked. 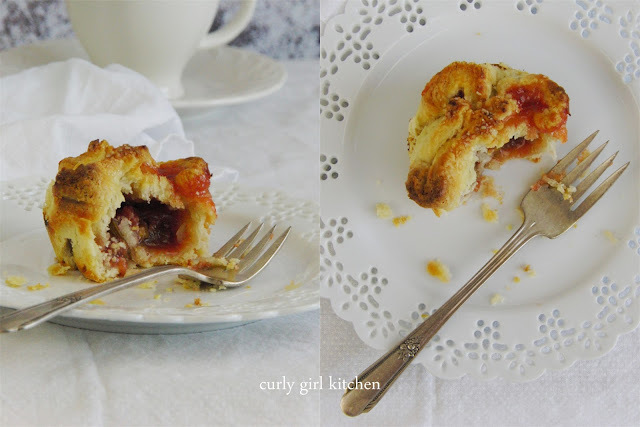 The house smelled incredible with the scent of pastry and tart rhubarb. 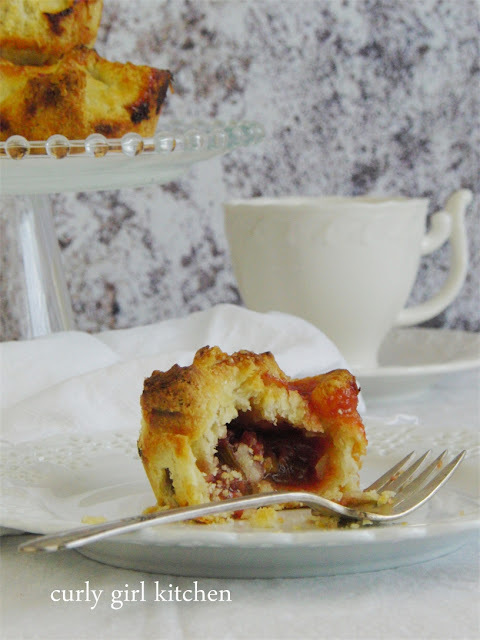 I tasted one while it was still warm, and the filling was nicely tart with a little sweetness from the jam. The pastry, flaky and buttery with golden caramelized edges, had a wonderful tang from the buttermilk. These little pies are perfect for people who love crust, since the ratio of crust to filling is a little higher than in a traditional pie baked in a deep-dish pie pan. They were so lovely, and I can't wait to make them again with other fruit fillings. Preheat the oven to 425 and line a baking sheet with foil. Spray with non-stick spray. Arrange the diced rhubarb in a single layer and sprinkle with the sugar. Roast for 20 minutes. In a bowl, combine the roasted rhubarb, jam and cinnamon. Set aside. 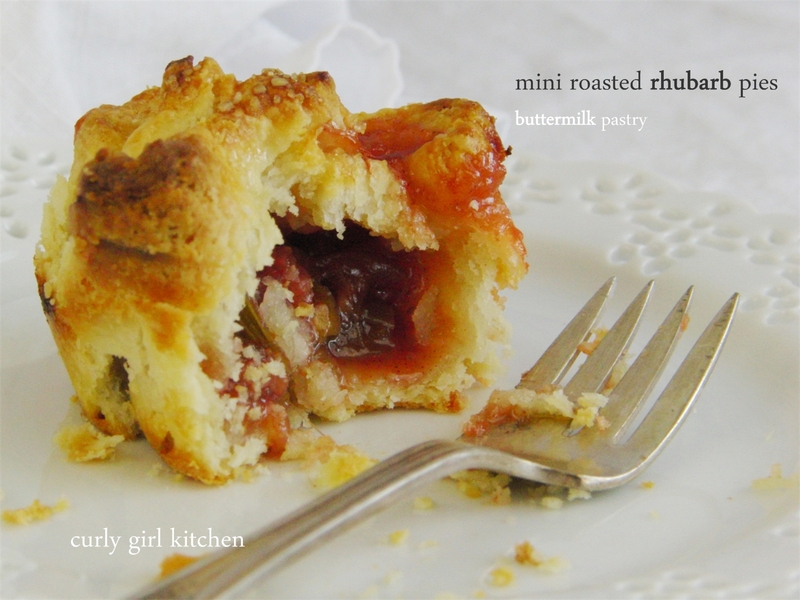 While the rhubarb is roasting, make your pastry. This is my all-butter pie crust recipe, with buttermilk instead of ice water to bring the dough together. In a bowl, combine the flour, sugar and salt. Use a pastry cutter to cut the butter in until pea-sized lumps remain. Stir in the buttermilk, then use your hands to work the dough, being careful not to overwork it, just until you can gather it together into a ball. On a floured surface, roll out the dough 1/8 inch thick. 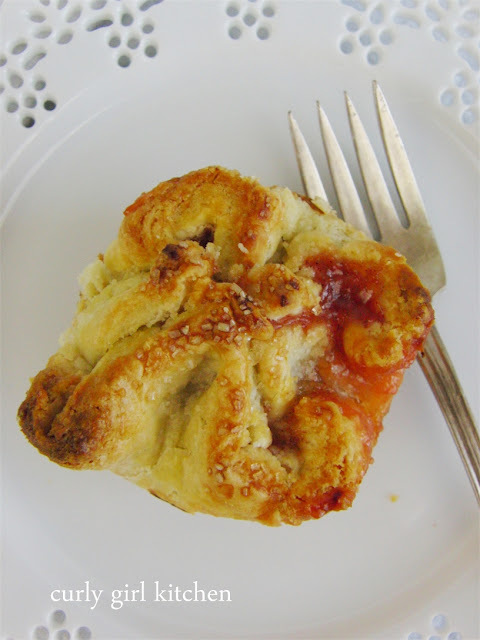 Use a pastry cutter or pizza cutter to cut the dough into 4x4 inch squares. Gather the scraps and repeat until you've used up all the dough. You should be able to get 15-16 squares. Spray a muffin tin with non-stick spray. Gently fit the squares of dough into the cups, so that the corners are sticking up. Spoon the filling into the dough, about a tablespoon for each cup. Bring the corners of the dough together and squeeze together gently. Freeze pies for 30 minutes. Preheat the oven to 425. Take the chilled pies, brush the pastry with the egg wash and sprinkle with turbinado sugar. Bake for 25-28 minutes, until a deep golden brown, the filling is bubbling and the edges are caramelized from the juices. Use a spoon to remove the pies from the muffin tin and cool uncovered on a wire rack. Serve warm, or at room temperature.